I heard this comment in a meeting yesterday, and how true it is. Evan Bayh just is not his father's son. In Birch Bayh's eyes, women should be given the same chances that men have. Women deserved equality and this was evident in his legislation. 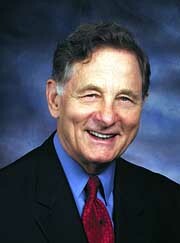 Former U.S. Sen. Birch Bayh of Indiana, considered the "father" of Title IX, the landmark federal legislation created more than 30 years ago that greatly expanded educational and athletics opportunities for girls and women, was honored during half-time of the women's basketball game between UConn and Rutgers on Martin Luther King Day. "Thanks to Title IX, women have taken their rightful place in American education - as students, teachers, administrators, and athletes," said U.S. Sen. Christopher R. Dodd, in joining University President Philip Austin to present the award. "Sen. Bayh's leadership as original author of this legislation has directly impacted the millions of young women whose lives have been touched and bettered through equality in education, collegiate athletics, and opportunities for success in virtually every aspect of American life." Although UConn began admitting women in 1893, many publicly funded universities did not admit women, and many women who did enter universities were discouraged from studying math, science, law, or medicine, before Title IX became law in 1972, Dodd said. Perhaps the most profound change came in the area of athletics, however; and participation by women in virtually every sport has boomed since passage of the act. "Title IX represented a major advance not just for women, but for all Americans and for higher education," said University President Philip E. Austin. "I'm proud that UConn has a long and worthy tradition in making a university education accessible to women, and I'm especially proud of our efforts to encourage women to pursue their aspirations in fields in which they have been historically underrepresented. "And of course, the success of our women's sports programs and what that means for all the people of Connecticut speaks for itself," Austin added. Bayh, who also served in the Indiana House of Representatives, represented Indiana in the U.S. Senate from 1963 to 1981. S. 1309, introduced by Sen. Evan Bayh, (D-IN) and two co-sponsors. H.R. 2979, introduced by Rep. Danny K. Davis (IL-7) and 27 co-sponsors. President Obama told Senator Bayh last year he would sign the bill when he gets it. Is it fair for our government tax dollars to go help take children from mothers, to help fund a custody battle in court, help that is only available to fathers? These funds pay for dads to do this. All dads are not good (see Dastardly Dads) Why should we help abusers take children from their moms. The American Judge's Association knows this is a problem, why do you want to fund abusers to take custody of the children? Yes, Evan, your dad took time to be with you. He didn't seek to take your mother out of your life though, did he? Yes, this apple has fallen very far from the tree.